If you've ever seen a Giant Spider Lily Crinum augustum 'Queen Emma' you know its presence in any garden setting commands attention. The bulb it comes from can weigh as much as 10-20 lbs and each strappy leaf is easily 6-8" across and 4-5' in length at maturity. An over-sized bud is just beginning to burst open into its stringy,tubular flower atop its thick, succulent stem. It's already been several weeks since a few of my neighbors (that I know casually) and I were standing in my driveway when one of them asked me if I'd like to have her Crinum Lilies. Yes, she has more than one and she was offering them to me. Just like that. I mean, we were talking gardening, but she had no way of knowing that I had long admired her Queen Emmas from a distance and had been on the search for one of my own. Mature Crinums are rather pricey. Above is one of them in her shady front yard. It has at least 10 pups growing from the side as well. 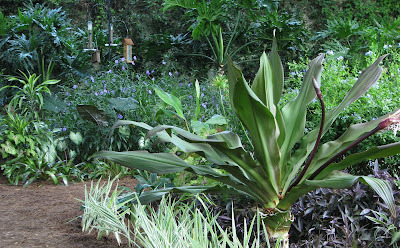 She has one more large Queen Emma which is the dark foliage variety and one Crinum asiaticum which is the all-green one. The flower on the QE is always a deep magenta with lavender hues. All white flowers are produced by the asiaticum. Needless to say, I was astounded and energized all at once by her offer. I asked her to give me a little time to create just the right place for the two Queen Emmas. The first one has enthusiastically been moved to make quite an imposing centerpiece in an area I've been renovating in the back garden. I've dug up lots of sod and made more pathways and plantings. It's a project I was working on before she made her offer. Right now it is all I see when I walk to the back garden. I'm sure I'll get used to it but I find myself just standing and staring at it for long moments in awe of my neighbor's generosity and in awe of the statement it adds. And bonus: although it's in the distance it is in straight view from my kitchen window, too. Aren't gardeners the most generous people! Did I mention I have THE best neighbors! I'm blessed beyond measure. Stay tuned ... we still have to move the second one. Wow Meems... That is one HUGE lily.. It does seem to tower over most everything, doesn't it???? 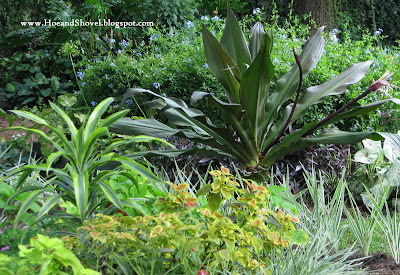 The Canna lilies are large --and speak loudly also! What did you do to your football team on Saturday???? I read in Darla's blog that you actually WENT to that game... Gosh--what happened???? Shocked me. They are cool plants...mine out back just bloomed again!! They call them Cannon Ball Lilies around here as well, you get it? The size of the bulb!! Betsy: She's probably too embarrassed to talk about the N---S, we are around here!! What a massive and beautiful lily. Your garden is so inspiring. Thank you for sharing. I've not heard the term cannon ball lilies but it makes sense... common names can be confusing but then again so can botanical names the way they change thema around sometimes. The pristine Queen Emmas in your beautiful garden show how well you have sited them. Right Plant- Right Place and then some. We can see how diligent you are about keeping the lubbers at bay. These are their favorite food. It also shows your love of Garnet colored lilies over less Bullish colored varieties. One thing for certain is that it IS massive. I better really like it because where I placed it~~ there is no hiding it. Ha. Thank you for stopping by Hoe and Shovel. It is anything in the Amaryllis family that is the favorite food of those ravenous lubbers and I have removed some damaged leaves. One thing for sure is they are easily sited on the enormous foliage. I'm still debating about placing one of the Queen Emmas in the newly front garden addition... will keep you posted. Wow Meems, I have never seen such a plant. It is striking. I can see why you need to admire it all you can now. Your neighbor is indeed a very generous person. I bet she was glad to just have someplace for her lilies to land other than a landfill. Funny, one persons trash is anothers treasure. Queen Emma is one Crinum I'd never even seen pictures. 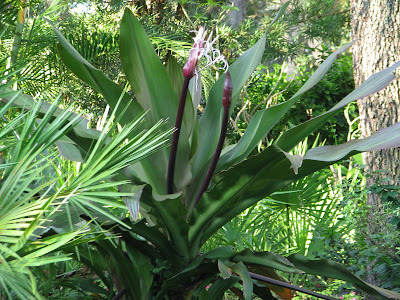 Most all here have trumpet-shaped blooms, except the String Lily. One of the Texas Hort guys says, "No crinum ever died." They might not die, but they definitely prefer good placement to do well. Fabulous! I think the "Queen" is happy in her new garden. Love the color and the foliage statement. I've long admired crinums and they are deer resistant. But, I just don't have a "perfect place" at this point. Perhaps in the future. 2.Go Bulls!!!! My Alma Mater! You got a lovely blog. I'm going to spend a lot of my time reading your posts. We stick by them too. We just tend to not mention them for a few days after a loss....Next Saturday there will be hoopin' and hollerin' in the house again..
Congratulations on your Blotanical Win. Meems, Congrats on your win!! and on the "Queen Emma". Have you noticed that many Q.E. 's in the nurseries have far more green in the foliage? Many have crossed with Asiaticum. There is nothing like a Deep maroon Q.E. for dramatic impact. Congratulations on your blotanical award==can't tell you how nice it's been to call you a friend. Your blog is always quality. Well it was a "brisk" 72 degrees this morning with much less humidity. YAY. That is the coolest temp we've had in months! I had lots more digging to do so it was a VERY welcomed relief. The soil temp in the veggie garden finally got below 80 last night. My seedlings are thankful and so am I.
I still don't understand why she had tired of the crinums... just said she needed space. Works for me... yes, my treasure now. Crinums are interesting lot... so many variety. I think this one is THE largest. I hope the TX hort is right in this case. It easy to see how the Queen reigns supreme as she towers over all the subjects near by. I had my fingers crossed that she would look as appealing in this place as I envisioned. I'm not disappointed. I'll respond to 1. :-) You don't have to come in the night... I have pups... definitely come get some. Thank you... so glad you've come by... pull up a chair and stay a while. Thank you... I need to get over there and see what all is happening. Thank you. I DO hope that is not the case with this QE... I'm hoping that a little more sunshine will darken her leaves... is that possible or am I looking at the ultimate results? I hope not... I'm wanting that deep magenta! You are a sweet friend to say such a nice thing. Thank you... I consider myself hugged. As soon as I get another spare minute I will head over to Blotanical to see what awards you (and others)won because I am certain there are some for you and your very informative blog. Right now, it's 3 year old time. Congratulations Meems for having the best Florida Blog! I am sooo happy for you! Happy that your kind neighbour gave you such a beautiful specimen of Crinum lily. Hugs and double hugs to you my friend. on your Blotanical Award!!! :-) Yea! Do you have crinums down there in Island paradise? I can't recall. Thank you for your hugs, sweet friend. Hugs and congrats right back to you... you must be very excited! What a nice award! I think I hear you singing to me... :-)thank you for stopping by to offer your congrats. Your keen eye behind the lens focusing on your stunning gardens and love for Florida shines throughout your posts, Meems ... no wonder you won the Blotanical Award for Best Florida Blog! It's been delightful connecting with you and your dear sister ... we both know, sisters are the best! You did it Meems!Congratulations on your award! Many years of happy gardening and blogging! Always a joy to see you. Thank YOU... and congrats to you as well. Well, we got the second one moved yesterday and it has been added to the newly renovated front garden. It is a standout there as well. I'm very excited about them. On a kick for large leaves now I think... Ha. Well that description qualifies just about every gardener I know. Ha. Thank you again for the rec... I'll definitely consider it. 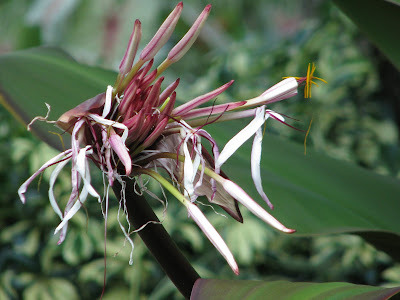 I would love to find a source for Crinum lily... I just returned to South Florida after 38 years in Minnesota and frequently see these beautiful plants in people's yards and commercial landscapes, but so far haven't found them in a garden center. Can they be started from the little (3/4 to 2 inch) onion-like bulbs formed after one of the flowers has finished blooming? Deet Queen... Crinums form pups at the base of the plants that can be separated from the mother plant and planted on its own. They are for sale in garden centers in my area but I don't know what to tell you about a resource in south Florida. I'm sure you've done a quick Google search for your region?? ?